HomeRacist Editorial Cartoon Mocks Phillips, Native Americans: How Best to Respond? The question came to me recently in a group email where people where sharing their anger over an ugly political cartoon that mocked Phillips and Native Americans in general. 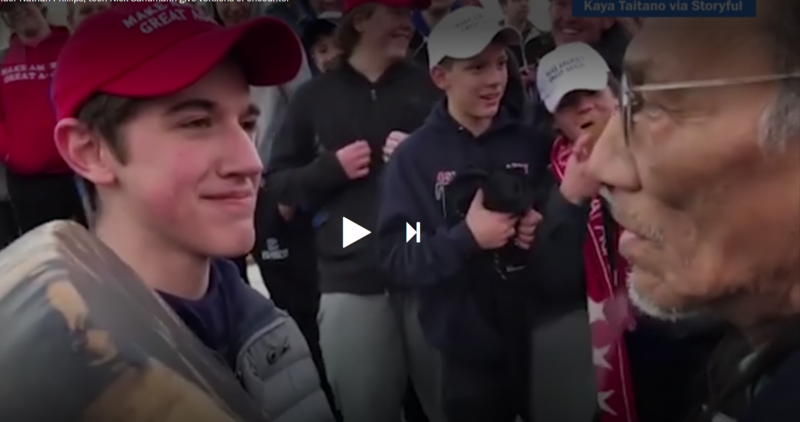 Screen capture from Washington Post story on the stand off between high schooler Nick Sandmann and Native elder Nathan Phillips. A little research showed that cartoonist Michael Ramirez is a Pulitzer Prize winner, the highest journalistic honor. I chose to write the Pulitzer Prize Committee and ask them to speak out against the cartoon. I figure if they can give out awards for outstanding work, they should call out deplorable work, too. And their comments would carry weight. Here’s an edited version of the email I sent. If you feel moved to write something, send it to: pulitzer@pulitzer.org. I write you today about a racist cartoon published by one of your Pulitzer prize winning cartoonists, Michael P. Ramirez. The cartoon concerns Nathan Phillips and Sen. Elizabeth Warren. I believe Ramirez and various publications that carry his work have every right to publish what they see fit and join the marketplace of ideas. But that does free them from public criticism. Your organization honored Ramirez with your award in 2008: “For his provocative cartoons that rely on originality, humor and detailed artistry.” Your organization lifts up professional excellence, do you ever call out the worst? If you do, this cartoon needs to be called out. I learned about the cartoon through an indigenous friend who included me on an email chain. People on the email chain expressed shock and disgust. Speaking for myself, I find the cartoon offensive, racist, and I believe for some indigenous people, retraumatizing. Phillips is an activist, has entered the public fray, and is not above criticism, but this cartoon is classless and ugly. While indigenous people have been very resilient, there is no question they have been — and continue to be — victims of racism, greed and lies. As it relates to the Phillips incident, the cartoon caption “I’m a Victim” is a racist dog whistle, a code word. I don’t recall Philips ever calling himself a “victim.” He simply spoke to his own intentions and experience. More broadly, the caption “I’m a Victim” is a device to cast all indigenous people in the category of chronic complainers, undermining their legitimate grievances. The caption accompanying Sen. Warren, “I’m an Indian … Have a Beer” plays into the stereotype of indigenous people as alcoholics. This cartoon is provocative, but appeals to readers’ worst instincts. It’s not courageous, original, or humorous. It simply uses old stereotypes to take a shot at people who have been at the receiving end of such shots for too long. Please speak up. Thank you for your consideration. I think this letter to the Pulitzer committee is excellent! Really clear and to the point about why it is truly offensive. The idea of sending it to the Pulitzer committee is brilliant. I’m so grateful that you did this. If I would change anything, I might ask more specifically for how you would like them to “speak up”, but I’m not sure that would make it any better. I truly hope you hear back from them. I so appreciate your work on behalf of Native people and everyone who works for an end to racism. I second Pam’s response. Well said and directed to the people who by changing their behavior can make a positive difference.